Use this option to sort alphabetically, using the operating system's locale tables to determine how accented characters are sorted, and how uppercase and lowercase sorting is handled. Use this option to sort alphabetically, according to ASCII value. The operating system's locale tables are not consulted. Use this option to sort numerically. The data will be interpreted as numbers, and not as character data. Alphabetic data will sort as though its value were zero. Use this option to sort chronologically by date. Be sure to set the proper Date Format in the options box provided. Use this option to IP Addresses data with proper consideration to each node within the address. Use this option to sort lines according to their length. 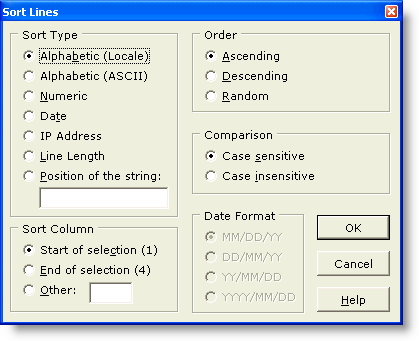 This option allows data to be sorted based on the position of a supplied string within the data. This option can be useful for segregating lines of data that contain a certain type of information. For example, by sorting on the string '@', lines containing email addresses would be isolated from those lines not containing email addresses. Use this option if the sort should be performed based on the starting column of the selection. The column number of the start of the selection is shown in parentheses to the right. Use this option if the sort should be performed based on the ending column of the selection. The column number of the end of the selection is shown in parentheses to the right. Use this option if the sort should be performed based on some other column in the data. Use this option to sort in increasing order. The sort command will consult the current locale so that accented characters are sorted according to the local collating sequence. Use this option to sort in decreasing order. Use this option to sort randomly. This option might be used to randomly order a list which was already sorted. When this option is selected, all other options become irrelevant. When an alphabetic sort is being performed, this option can be used to ensure that character case is considered significant. When an alphabetic sort is being performed, this option can be used to ensure that character case is ignored. The date options below are applicable when a Date sort is being performed. The slash character is shown for illustration only; any separator symbol--or none at all--may appear in the data being sorted. Data is formatted with 2-digit month, date and year. This option can also be used for MM / DD / YYYY format dates. Data is formatted with 2-digit date, month, and year. This option can also be used for DD / MM / YYYY format dates. Data is formatted with 2-digit year, month, and date. Data is formatted with 4-digit year, 2-digit month and 2-digit date.